That’s what Brian Boyle’s wife Lauren told him earlier this week when he got the invitation to fill in for injured teammate Taylor Hall at NHL All-Star Weekend. Except, it wasn’t that easy. As if this season wasn’t already trying enough, Boyle’s two-year-old son, Declan, was in a Boston Children’s Hospital this week for treatment of an arteriovenous malformation in his jaw. Spend the break with Declan or go fulfill a boyhood dream to be recognized among the best players in the world? It was an agonizing decision, one with no right answer. Lauren made it for him. “She knows that I’ve worked my whole life to play this game,” Boyle said, fighting to keep his emotions in check. Every NHL All-Star Game is remembered for something, a signature moment. Last year in Los Angeles it was Wayne Gretzky standing on the ice with Bobby Orr and the NHL’s 100 greatest players of all-time. Two years ago in Nashville, it was improbable All-Star John Scott being carried off the ice on the shoulders of his teammates as MVP. Led by captain Connor McDavid, the Pacific Division took home the $1 million prize on Sunday when it knocked off the Atlantic Division, 5-2, to win the All-Star Game. Canucks rookie Brock Boeser was named All-Star MVP. But If Tampa Bay’s All-Star celebration is remembered for anything, it will be Boyle being feted in the city he called home for three seasons. This was a John Scott-like feel-good story, but in a meaningful real-life way. The entire hockey world was pulling for Boyle in his battle with chronic myeloid leukemia (CML). 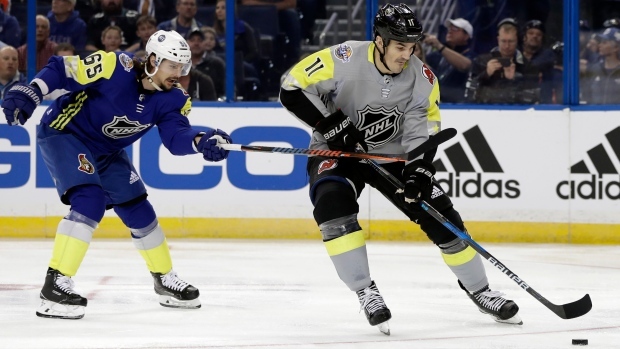 But Boyle consistently received the loudest ovation at the Skills Competition - even next to the hometown Lightning stars - and the crowd chanted “Bri-an Boy-le” during the second intermission of Sunday’s three-on-three contest. Boyle is genuinely appreciative of the support. He hopes having the conversation about his situation will raise awareness and money for medical research. But he wants people to know he is in a good place. Everything could have been much worse. Boyle was diagnosed with CML in September after New Jersey Devils doctors noticed an abnormality on his blood work drawn for a standard training camp physical. Thankfully, CML can be treated without chemotherapy or radiation. He takes two pills in the morning and another two later in the day. The first three days were rough, he said, with headaches and nausea. But the side-effects have been “almost non-existent” since then; he’s tasked only with monitoring his diet a little more closely. The crazy part of the story is that around the same time Boyle was dealing with his own shock of the dreaded “C” word, he and Lauren were living every parent’s worst nightmare, with doctors preparing them for another dose of it. A mass developed on Declan’s jaw and doctors feared he might have Ewing’s Sarcoma, a rare form of bone cancer in children. That it was an arteriovenous malformation in Declan’s jaw, and not cancer, was a huge sigh of relief. “We were so scared,” Boyle said. “We didn’t know what it was and they were telling us what it might be to prepare us. It was the worst two days of my entire life. Hockey was understandably just about the last thing on Boyle’s mind. Boyle returned to the ice on Nov. 1 and scored in his first game with the Devils after missing the first month of the season. It’s been an almost magical ride since then. He’s on pace to match his career-high of 21 goals and set a new mark with 37 points. Hockey has been Boyle’s release. Well, Boyle has played like an All-Star. He pinged the targets in the Accuracy Shooting contest on Saturday night just 0.002 seconds shy of winner Brock Boeser. Boyle wrestled with the decision to attend, but said he felt his family made the right call. He loves the game, but this was the weekend for the game to love him back.